Red Velvet – Save the Animals! | What shall I have for dinner? Red Velvet – Save the Animals! Earlier this month, the beautiful Bubba Belle ‘came of age’ and turned the big 18. 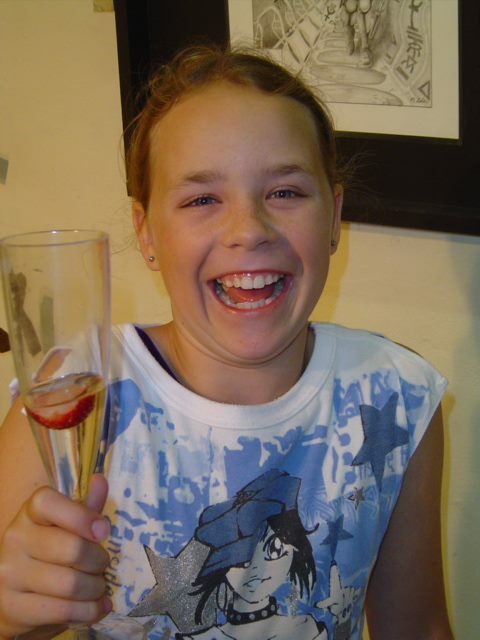 She’s going to hate me for it, but here’s a pic of the little darlin’… Well, this was her 8 years ago, anyway! So Belle is not only a gorgeous young lady, but also a passionate one. See, she’s a strict vegan staunch defender of every animal on the planet. Which is very admirable, but makes it very difficult to bake her a speccy 18th birthday cake… And so to my friend Google for some advice! 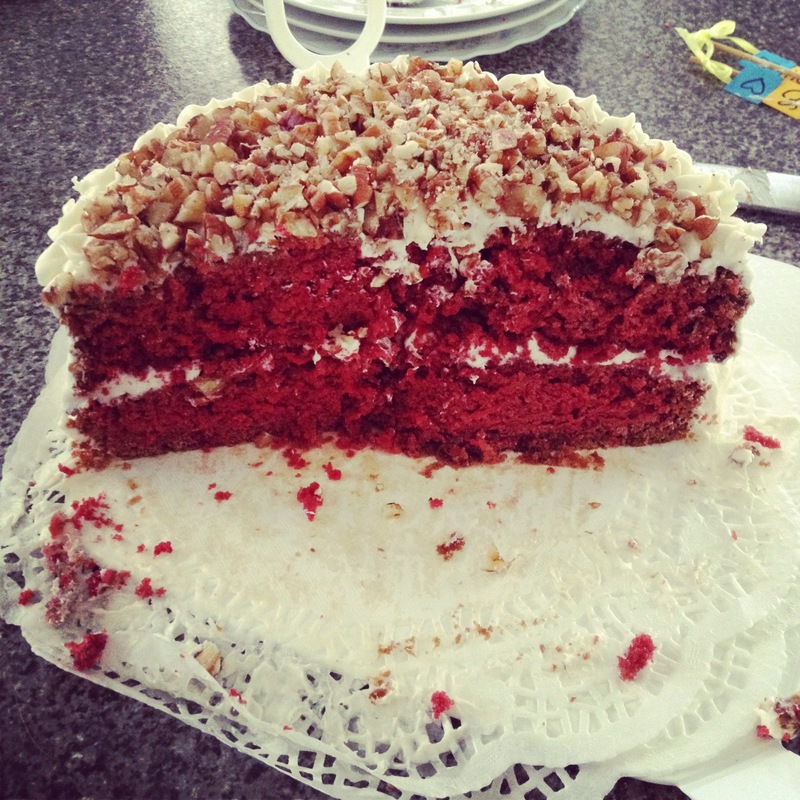 One of my most favourite cakes is the red velvet cake. It has a moist texture, a slight chocolate flavour and the bestest frosting in the world – cream cheese! The problem is, red velvet cake has many animal-derived ingredients – butter, eggs, milk, cream cheese and red food dye (which apparently is made from beetles…). Always up for a challenge, I decided to find a suitably animal-free version of the cake (of which there were many). Unfortunately, none were to my liking (read: none involved creaming a butter-substitute and sugar as a first step), so I decided to adapt a few recipes to form my own. And might I say, very successfully! 1. Grease 2 x 20cm cake tins and line the bottoms with baking paper. Preheat oven to 180 degrees. 2. Cream Nuttelex and sugar, then add vanilla. Mix until sugar has dissolved as much as possible. 3. Sift all dry ingredients. Fold all dry and wet ingredients into the butter mixture. 4. Divide mixture between the 2 tins and bake until cooked through – should take about 40min. 1. Beat Tofutti and Nuttelex until well combined. 2. Add icing sugar, a third at a time, beating well in between each addition. 3. Add lemon juice and beat well. 4. Put a layer of frosting between the 2 cakes, then use the rest to ice the cake. 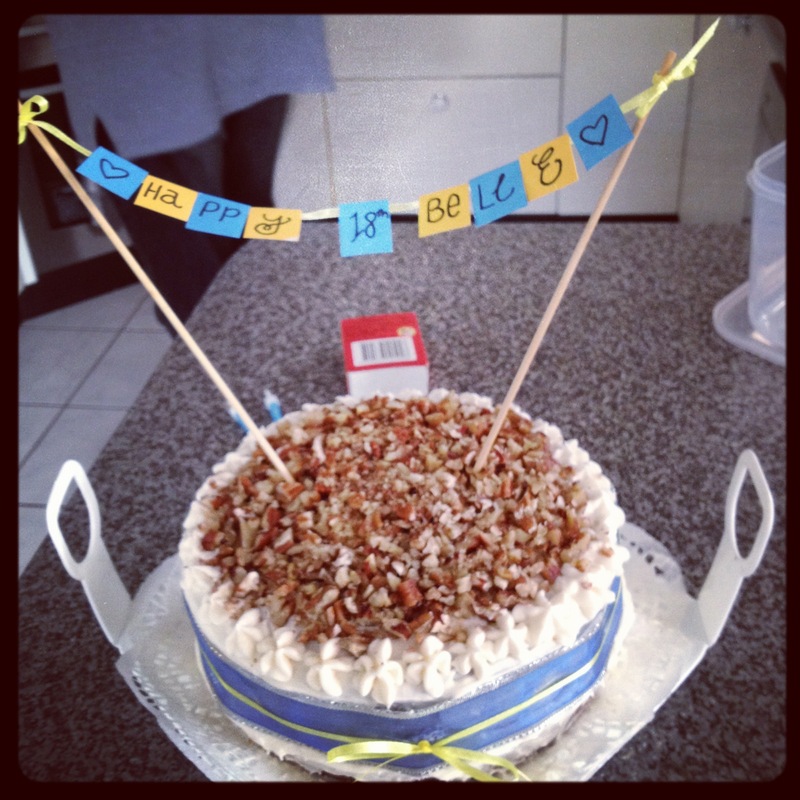 I topped the cake with vegan-friendly chopped pecans (although I was tempted to use 100’s and 1000’s – good job I didn’t! Apparently there are animal products in them…). The end result? Thanks Belle! By the way, the recipe makes plenty of icing – all the better for enjoying later on!